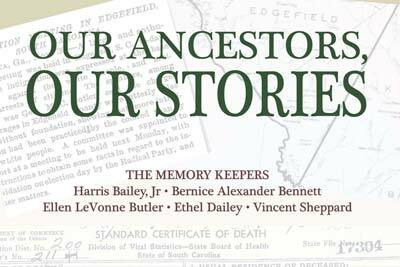 The public is invited to a book signing on Sunday, April 27, 2014 at 3:00 p. m. for a new book, Our Ancestors, Our Stories, in the Lynch Building Annex of the Tompkins Library, Edgefield, SC. 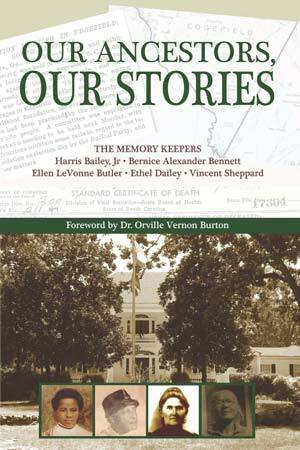 Our Ancestors, Our Stories chronicles the history of blacks in Edgefield and the journey of one historian and four individuals, who came together to share their family stories, create a family legacy, and fulfill a vision to write and publish a book about their African American ancestors of Edgefield County, South Carolina. 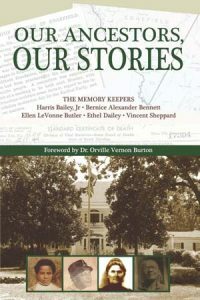 This book offers you insights into the African American experience in Edgefield County, South Carolina through the eyes of five very different authors, who have a strong belief that it is their responsibility to tell these stories. They want their ancestors to be remembered as individuals who lived, loved, worked, survived, raised families, and had faith in God. Through their walks in life from slavery to freedom, they left a legacy. They were not rich or famous, yet they left many trails to follow. Their lives gave shape to the memories of these authors, and they celebrate the opportunity to share their very personal journeys with you. As African American authors, they share the journey to honor their ancestors and tell their stories. The lives of individuals who lived in Edgefield, South Carolina will come to life as each chapter in the book evolves into a story for the reader. The authors discovered Edgefield as their ancestral home through researching their genealogy. Through these stories, the rich value of using primary and secondary sources become evident as each discovery examines relationships in the home, the neighborhood, and the community.